The New York State Trial Lawyers Institute (NYSTLI) has been providing legal education for trial lawyers, both live and taped, since 1986. It has been an accredited provider of Continuing Legal Education (CLE) since it became mandatory for New York attorneys in 1998. The faculty is composed of leading practitioners, academics, judges and other experts. We provide REAL trial CLEs for REAL trial lawyers - NYSTLI gives you the tools you need to win. 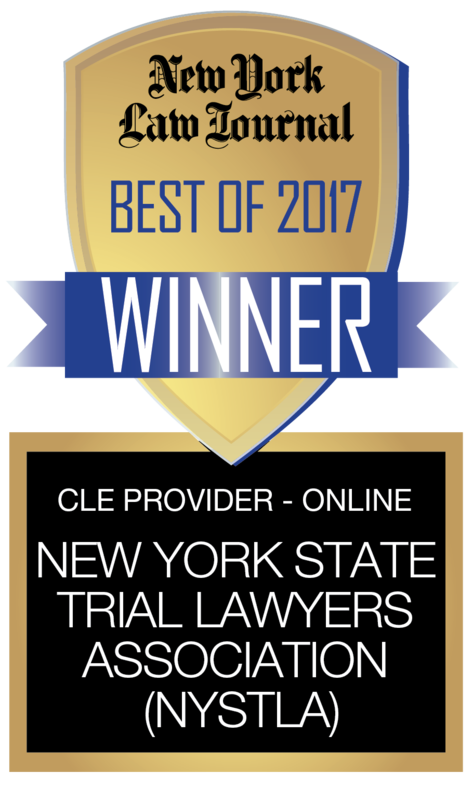 Voted BEST CLE Provider 2013, BEST CLE Provider 2014, BEST CLE Provider 2015, BEST CLE Provider 2016, BEST CLE Provider 2017, BEST CLE Provider 2016, and BEST CLE Provider Online 2017 by the New York Law Journal's Reader Rankings Survey. Looking for credits? 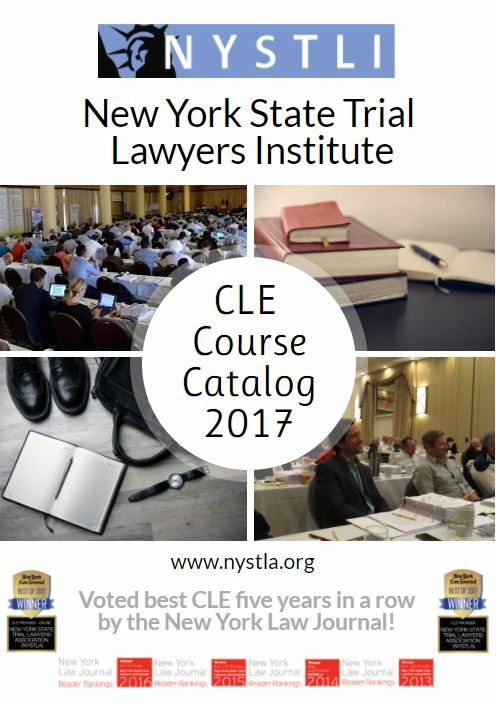 Browse our full CLE Course Catalog by clicking the image below or clicking here. Order NYSTLI's signature annual CLE program! DECISIONS is designed to provide you with the most comprehensive and effective review of last year's decisions, statutory amendments, and other updates in New York tort law. Our statewide program is taught by extraordinary leaders in the legal community (originally taught at six different locations around the state - New York City, Staten Island, Westchester, Buffalo, Long Island, and Albany) and will be available on cd, dvd, and online on-demand. The program covers 18 topics: Damages, Discovery, Ethics & Professionalism, Evidence, Insurance, Jurisdiction, Labor Law, Legislation, Mass Torts, Medical Malpractice, Medicare & ERISA, Motor Vehicle Liability & Developments in No-Fault, Municipal Liability, Pleadings & Filing, Premises Liability, Product Liability, Trial Practice, and Workers' Compensation. Please click here to check our calendar for live events and easy online registration. You can register multiple members at the same time with our easy online sign process, and immediately receive a confirmation notice. Choose from our excellent selection of self-study programs captured at our live programs. These very popular programs allow you to study at your own pace, without the need for an Internet connection. Please browse our online catalog of CDs, DVDs and Books. If you would prefer to download the catalog, and mail or fax in your order, please click here. Take these programs, self-paced, from your computer. Click Here to view all of our online seminars. Call for financial hardship policy at (212) 349-5890 and ask for Traci. Please contact us at (212) 349-5890 or info@nystla.org.